In this video pack, experienced high stakes pro Alex talks in detail about preflop and flop strategy in HUSNGs. Alex 'Lotte Lenya' has been a top HUSNG player for over five years now. With over 3 million dollars in winnings and a reputation as a no-fluff teacher, his instruction is highly sought after and his respect in this game is second to none. His focus on this video pack was to take highly valuable concepts that can be utilized at every level of play, from low stakes to the highest, and bring them to viewers in an efficient and easy to understand way. The result is a concise presentation of valuable advice for hyper turbo HUSNGs, focused on preflop and flop play. Below is a graph of just some of Alex's hyper turbo HUSNGs played on PokerStars. 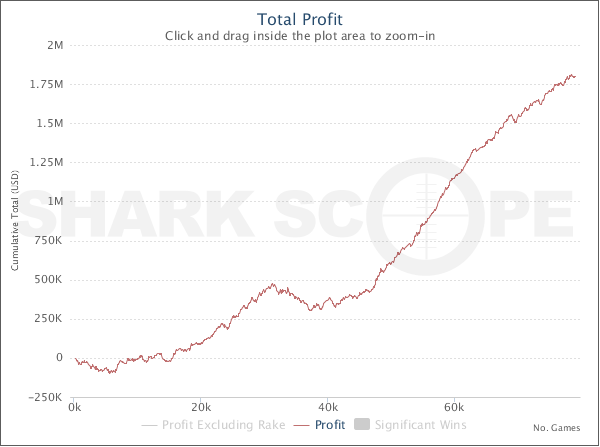 When combining his hyper turbo results on non PokerStars sites, as well as his turbo speed HUSNG results, he has over 3 million dollars in total profit lifetime. If you include the rakeback he has pocketed over the years, he has made close to four million dollars lifetime from HUSNGs. Over 50 slides and charts demonstrating fundamental preflop and flop theory. This pack does not work on a Mac or Linux computer. It requires windows. Please email us for potential Mac/Linux solutions.